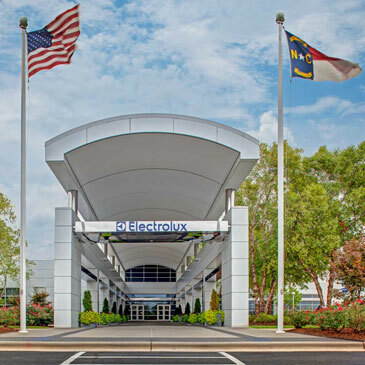 Charlotte, NC April 2, 2014 – Electrolux today named Columbia, SC-based Red Rock Developments as the developer for the expansion of its North American headquarters, their second expansion at this location in three years. Electrolux has entered into a 20-year lease agreement with Red Rock, who will be responsible for the development and financing of the $85 million project. Red Rock has also entered into a programmatic joint venture arrangement with Marc Realty, a diversified real estate investment company based in Chicago, IL, to jointly finance the project. Electrolux plans to build a second facility adjacent to the existing headquarters. It will bring 810 new jobs in the areas of research and development, marketing, design, engineering, supply chain, finance, IT and executive management. Features of the new six-floor, 375,000-square-foot building will include LEED certification, solar panels, a roof garden and a courtyard. Red Rock Developments’ primary focus is on the build-to-suit development of single tenant, net lease facilities for office, industrial and retail users. Their single tenant services also include acquisitions, net lease advisory services, and landpark development, redrockdevelopments.com. Marc Realty is a diversified real estate investment company based in Chicago with net lease holdings nationwide, marcrealty.com.